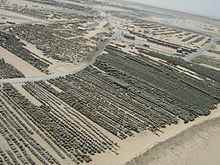 Thousands of tires and other military equipment line a staging area, 2004. Camp Arifjan is a US military installation used as a forward logistics base, Aviation Classification and Repair Activity Depot (Task Force AVCRAD) for the entire Southwest Asian Theater (through Patton Army Air Field), helicopter ground support base, and as a motor pool for armored and unarmored vehicles. U.S. military vehicles that did not receive new additional armor plating in the United States prior to deployment to U.S. Central Command–tens of thousands–received their "up-armoring" at Camp Arifjan. Additionally, many thousands of service members and contractors pass through Camp Arifjan either on their way to or from Iraq, Afghanistan or other countries in Southwest Asia. The service members deployed to Camp Arifjan are in a variety of different statuses. Many are on active duty and come on a one-year Permanent Change of Station (PCS), while some active duty come in a Temporary Change of Station (TCS) status. Additionally, there are many Guard and Reserve units that support a variety of functions in the SouthWest Asia [SWA] theater that come on varied length tours. Comedian Robin Williams signs autographs at Camp Arifjan, Kuwait, Dec. 17, 2007, during the second stop of the 2007 USO Holiday Tour. Jason 'Wee Man' Acuna poses with a Soldier at the Exchange in Camp Arifjan, Kuwait in 2010 during a USO tour. Because of the Khobar Towers bombing of 1996 in nearby Saudi Arabia, the U.S. Army decided to replace Camp Doha near Kuwait City with a base more protected from terrorist attacks. In July 1999, the Kuwaiti government began constructing Camp Arifjan south of its capital. Patton Army Airfield is the United States Army airfield, located within the camp boundaries. Patton Army Airfield is run by elements of the Army National Guard's Aviation Classification and Repair Activity Depots (AVCRADs). Organizational (AVUM), Intermediate (AVIM) and limited depot maintenance support is available via Patton Army Airfield and its corresponding AVCRAD elements to many United States military aviation assets within the Southwest Asian Theater (SWA). The airfield is named in memory of General George S. Patton. The base has undergone many changes within the past several years, including the construction of half a dozen barracks, hundreds of "temporary" or transitional barracks, known as PCBs (Pre-Fabricated Concrete Buildings), three dining facilities, and the establishment of three base exchanges (AAFES), as well as a major addition of paved roads throughout the Camp. There are approximately 9,000 personnel stationed at Camp Arifjan. In addition, a number of foreign nationals also work at the base. The facility is primarily staffed by US Army Contractors. The base leadership continues to allow local and Third Country National vendors to set up small shops within the main PX lobby. In addition to the permanent vendors, certain vendors are also allowed to set up large Arab-style bazaars on Wednesdays and Sundays. Opening of Chili's on Camp Arifjan, Kuwait, by Al Ghunaim Trading Co. and Gulf Civilization. Camp Arifjan has many fast food restaurants on site, such as: Pizza Hut, Charley's Subs, Hardees’s Burgers, three Subways, Burger King, Pizza Inn, Taco Bell, KFC, Baskin Robbins, Panda Oriental, Green Beans Coffee, two Starbucks, Coffee Bean & Tea Leaf, and Cinnamonster. There is also a large Chilli's restaurant with 250-person seating capacity, as well as three Military Dining Facilities (DFACs), some of which serve four meals daily. In addition, the camp - known colloquially by the initials "AJ" or as Camp Arif-jail- is regarded by U.S. military personnel as having the best recreational facilities of any Kuwaiti military installation. The camp's swimming pool and three gym facilities make it the most desirable duty station in the country among foreign military personnel. Recreation centers are located in Zone-1 and Zone-6. ^ Stephenson, Mercedes. "Troops serving in Kuwait lose major tax exemption". CTVNews. Retrieved 2017-02-09. ^ Johnson, Chalmers A. (2004). The Sorrows of Empire: Militarism, Secrecy, and the End of the Republic. p. 243. ISBN 1-85984-578-9. ^ "Contractors Supporting Base Operations in Kuwait" (PDF). Archived from the original (PDF) on 2016-12-24. ^ "Area Support Group - Kuwait - Photos | Facebook". www.facebook.com. Retrieved 2016-07-25. ^ Local 21 News (11 July 2013). "Passing the time in Camp Arifjan, Kuwait is not much different than us". Archived from the original on December 10, 2013. Retrieved 21 January 2014. ^ Anderson, Kelly (2011). ABU: The Story of the Prison Abuse at Abu-Ghraib Iraq. p. 91. ISBN 978-1-4620-0475-1. ^ "USO Camp Arifjan". Facebook. Retrieved 25 April 2014. Wikimedia Commons has media related to Camp Arifjan. This page was last edited on 27 February 2019, at 10:16 (UTC).